I’ve blogged before on the topic of 3-Act Math Tasks, but I wanted to share some great resources that feature a host of 3 Acts that you can use and resources to help you use them more effectively in the classroom! First of all, let’s review. The biggest thing that 3 Acts Math Tasks accomplish is helping students exercise metacognition (thinking about thinking) as they work through the different acts. 3-Act Math Tasks are a great way to implement the 8 Standards for Mathematical Practice! 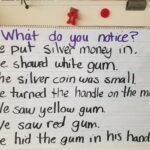 Beginning with the posing of a mathematical problem in the first act, either in an image or a video, in the second act, the students then explore the problem while you answer questions that arise from their exploration. The third act is the grand reveal of the answer and an opportunity for whole group instruction. A previous blog post on 3 Acts Math Storytelling that goes into more depth, complete with videos! Dan Meyer’s blog on the Three Acts of a Mathematical Story. 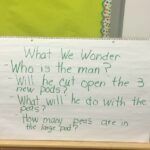 A recent Math Mania Monday video archive that demonstrates a 3 Act Math Task in action. Free resources in our store, including guidelines for 3 Act Math Tasks and two recording booklets for various grades. Originally, 3 Act Math Tasks were developed for middle/high school students. But that doesn’t mean that you can’t use them in K-5! 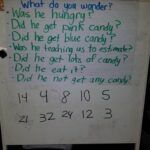 Here are some pictures that show how you can work through a 3 Act Math Task on chart paper in a K-1 classroom. Once you’re ready, check out these great websites that have feature 3 Act Math Tasks you can use in your classroom! Dan Meyer’s resources (http://blog.mrmeyer.com/ – click on Three-Act Math) are geared more for middle/high school age students. Graham Fletcher (https://gfletchy.com/3-act-lessons/) features tasks more appropriate for elementary students (K-5). Get your students involved in the creation process. Have students in grades 3-8 create their own 3 Act Math Tasks for other students to solve. Be sure to share them with us! 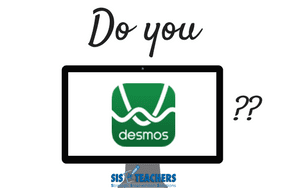 If we get enough submissions of student-created tasks, we will feature them on the blog! 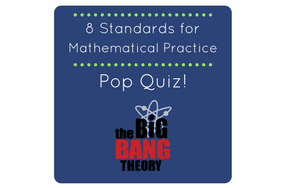 8 Standards for Mathematical Practice: Pop Quiz! 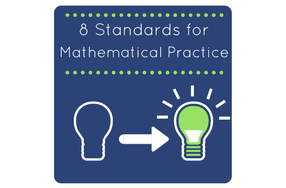 The 8 Standards for Mathematical Practices are what I feel is the biggest shift in history in how we teach math. We are not simply putting a new name on the old way of doing business in math education, but instead we are actually changing to a new method of educating students in mathematics.